Starting August 25 and running through October 1 is a special time in Orlando. No, I’m not talking about the first half of the Epcot International Food & Wine Festival, I’m talking about Visit Orlando’s Magical Dining Month. This event takes 100 local restaurants that are willing to offer a three course prix fixe meal every day for $35. Each meal will consist of an appetizer, entree, and dessert with one dollar of each meal sold going to selected charities. This year’s charities are Freedom Ride, which provides therapeutic horseback riding to individuals with disabilities, and BASE Camp, a support setting for children and families battling with cancer and all of the challenges that come with such a battle. A worthy cause in and of itself, this year’s event is a bit more magical as, for the first time ever, Walt Disney World has six restaurants taking part. 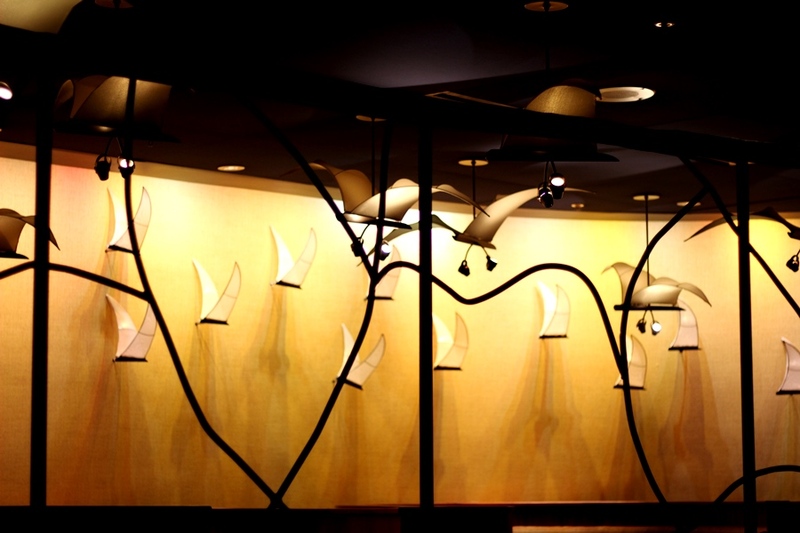 These select restaurants cover a wide array of culinary styles and tastes, providing the opportunity for all to take part in the Magical Dining event. The Disney restaurants that are engaged in the charitable initiative are Boatwright’s Dining Hall, Grand Floridian Cafe, Jiko – The Cooking Place, Olivia’s Café, The Turf Club Bar and Grill, and The Wave… of American Flavors. For opening night we opted to head on over to Jiko. It is worth noting that the prix fixe menu items are a smaller portion size than their full menu counterparts, but after three courses I’m fairly certain I couldn’t have fit any more food in my stomach even if I wanted to. For appetizers, Jiko is offering either the Jiko Salad or Inguday Tibs in Brik. 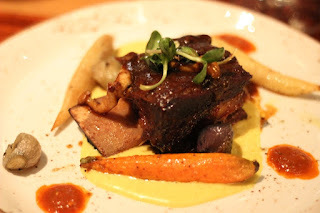 Entrees have three selections to choose from, including Bo Kaap Malay Seafood Curry, Botswana-style Seswaa Beef Short Rib, or West African Koki Corn. Last, but certainly not least, dessert options are Malva Pudding or Safari Sunset. The great thing we noticed about the menu was that it invited you to move away from some of the more recognizable and commonly ordered dishes and give something new a try. With that in mind let’s briefly run through the items we were able to sample on our visit. 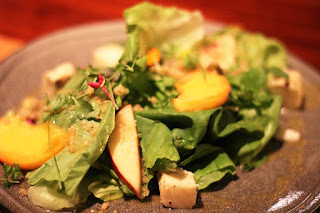 The Jiko Salad is listed as containing Epcot Land Pavilion greens, stone fruit, pistachio halva, and grilled halloumi cheese with an apricot-ginger dressing. Anything with greens from The Land has to be good right? Seriously though, this is exactly what you would expect from a salad that is tossed with a light fruity dressing. This was my first time trying halloumi, which is a strongly flavored cheese, but that has a smooth consistency. Think of it as a blend between mozzarella and feta. It is an easy opening note for those not-as-adventurous eaters. 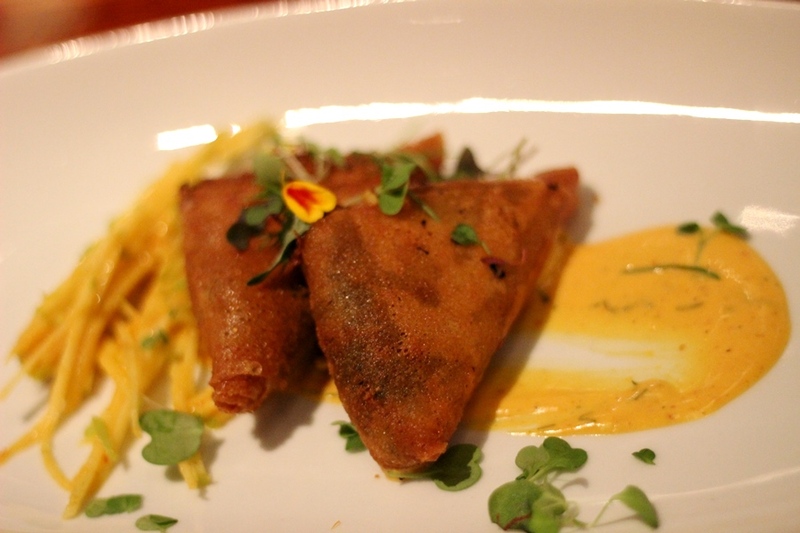 The other appetizer option is the Inguday Tibs in Brik and includes mushrooms, spinach, and cheese in crispy Tunisian filo, apples, and curry vinaigrette. These are savory little pillows of deliciousness! The internal mixture of spinach, mushroom, and cheese is not mushy, but very fresh and its saltiness is served well by the sweetness of the julienned apples and spices of curry vinaigrette on the outside, which you can ignore or pair with as you choose. Moving on to the entree section of the menu, we were unable to try the West African Koki Corn, but did give everything else a whirl. Starting with the Bo Kaap Malay Seafood Curry, it is comprised of calamari, red shrimp, mussels, and coconut-curry sauce over saffron rice. The coconut flavor is minor, almost overshadowed by the tomatoes and other spices of the curry. 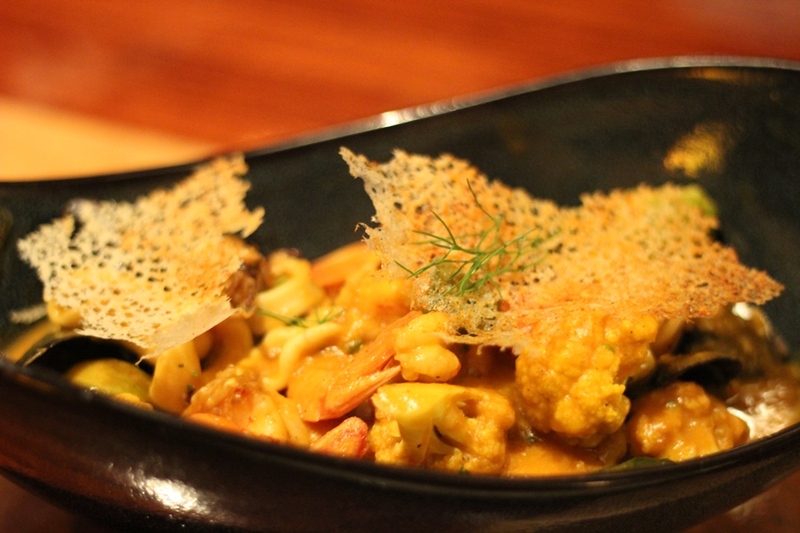 There is a ton of seafood in this dish, and each piece was cooked to perfection. Next up was the Botswana-style Seswaa Beef Short Rib, served with cassava-potato puree, sambal, baby carrots, and mushrooms. The short rib meat is fall off the bone tender, and while there is a bit of fat to contend with, it is very easy to get fork after fork full of meat. There is also a bit of a choose your own adventure component to this entree, as the carrots, puree, and sambal are separate from the rest of the dish, allowing the diner to make each bite as spicy or not as they want. Also, a well-rounded bite will take some work, but it’s worth it. Dessert is the final section of the prix fixe offerings, and we’ll start with the Safari Sunset. 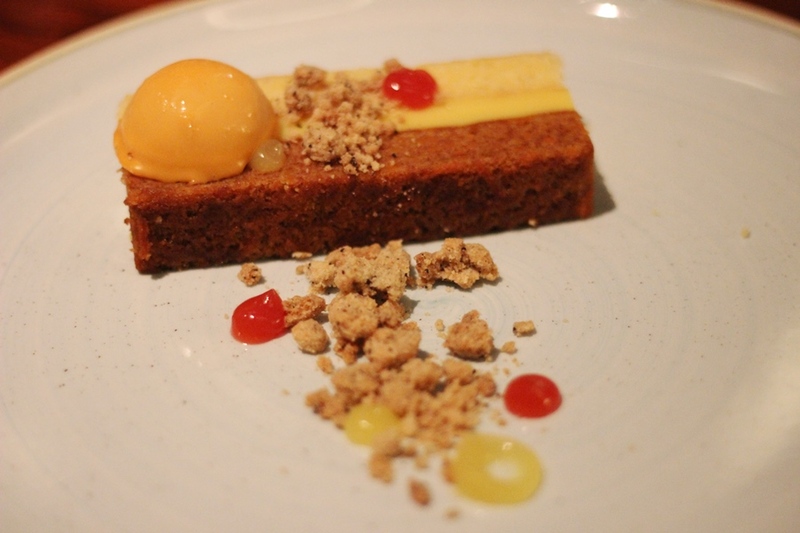 This dessert includes carrot cake, cornbread calamansi, and lemon cremeux with Kenyan coffee streusel, citrus gel, valrhona dulcey mousse, and candied carrots. This sounds very, very complex with a ridiculous number of components, but is, in fact, a very simple layer cake with a couple of accompaniments. The base is carrot cake with the second layer being cornbread, and both being held together by the lemon cremeux. By the way, this isn’t the cornbread you’re thinking of, it is more akin to yellow cake with a hint of corn. This sounds crazy all thrown together, but it is absolutely delicious. The Malva Pudding is the other dessert to contend with and includes melktart ice cream, kataifi, and kanu tuile with a cabernet gelee. There are a lot of unknown words there, but here’s what you need to know. 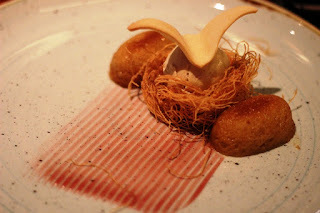 The main dish is a custard-type of ice cream, in a nest of fried dough that reminds me of the thin strands in Shredded Wheat, topped with a canoe bird-shaped cookie that is delicate, but with flavors reminiscent of a shortbread cookie. It has a pair of donut type pastries and a sweet and sour gelee. Eat everything in one bite, or take it apart and play with putting different components together, no matter how you eat this dessert, it is definitely okay to play with your food. I feel like I made a lot of choose your own adventure references during this review of Jiko’s offerings for Visit Orlando’s Magical Dining Month, but it is kind of fitting. Many of the restaurants taking part in this worthy cause are not places that you would venture out to often, or would only look at as accessible for a very special occasion. However, the prix fixe menu casts the nets wide, both in terms of the restaurants themselves and the menu items each restaurant is presenting. Jiko is no different, and has a ton of flavors to introduce you to. I hope you’ll consider visiting Jiko or one of the other restaurants taking part in the event this month.